Just a super quick post today just to show you what I've been up to. I've been so tired lately and have been feeling not very with it. So will keep it short. 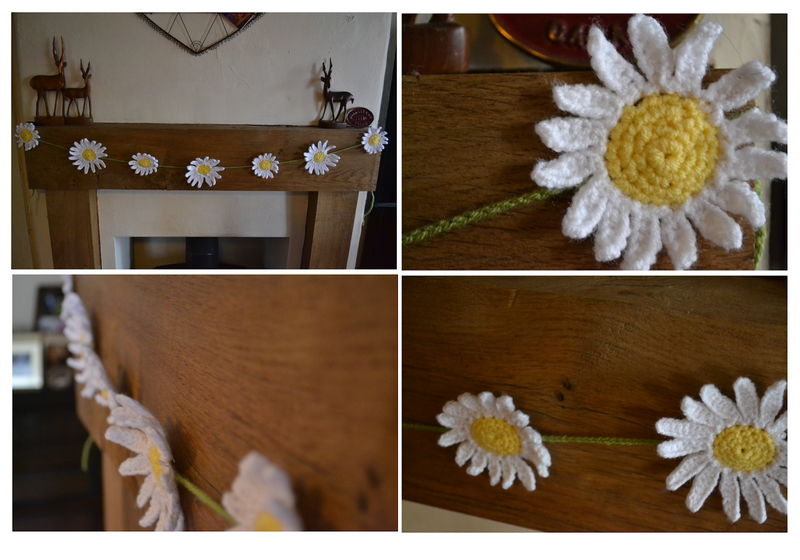 Here is what I did with the crochet daisy, made a little garland. My bother's girl friend calls it seasonal bunting as I change it often. I now have the width of my gypsy caravan blanket and have been happily hooking up these simple colourful squares. Sorry it's so brief should be fighting fit by next week, fingers crossed. Thank you as always for your lovely comments. Hope you are feeling better very soon, I love those daises, they would make me smile every time I looked at them. Those daisies are so cute, hope you feel better soon. I hope you feel better soon. I love the daisies, they're so delicate and sweet. Your garland is lovely ! A touch a spring in the house ! And your blanket will be beautiful ! Have a cozy weekend ! OH. MY. GOSH!!!! I have seen a lot of crochet flowers but I think your daisies are the prettiest I have seen by far! I love them! Absolutely adorable. I am, however, sad to hear that you have been ill, I Hope that you're feeling better and that your weekend is going well. I hope you are feeling better. Your garland is so pretty. It announces Spring is Here!. Your granny square blanket is quite pretty also. Hope you feel better soon. Just love the daisy garland. i hope you are feeling better. i love the daisy-garland and your gypsy blanket looks wonderful.you have a nice blog! I do hope you feel better soon found you via Chrissie Crafts lovely blog, your seasonal bunting is just the thing to cheer us all up on this rainy day! Looks amazing. I hope you feel better soon.